If you wanted the Elantra Coupe, better hurry and grab one of the remaining 2014 models, because it is cancelled for 2015. Other changes for the 2015 Elantra include new paint colors and a number of new option packages designed to make this popular car even more appealing. Among them is a new Tech Package for the Sport model that adds a navigation system, Blue Link services, and a premium sound system. Elantra buyers select from SE, Sport, and Limited trim levels. The Sport and Limited models are similarly equipped, the former a more powerful model designed for greater driving engagement, and the latter featuring more upscale detailing, heated rear seats, and Hyundai’s Blue Link telematics system. Highlights for both the Sport and Limited models include LED running lights, LED taillights, fog lights, and 17-inch aluminum wheels. Leather upholstery, heated front seats, a power driver’s seat, and a leather-wrapped steering wheel and shift knob are also standard for these models, along with a power sunroof, a reversing camera, and a 4.3-inch touchscreen radio with Bluetooth connectivity. 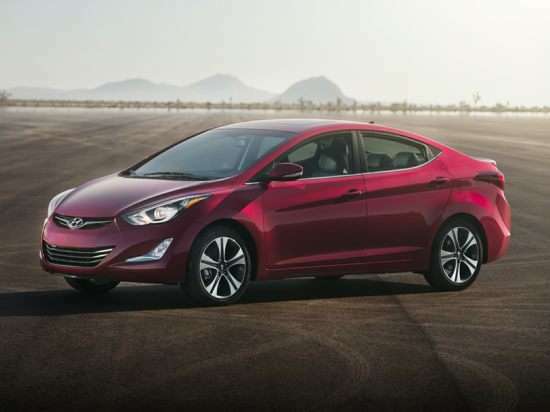 The Elantra SE and Limited models are equipped with a 1.8-liter 4-cylinder engine making 145 horsepower. A 6-speed manual gearbox is standard for the SE, while the Limited is equipped with a 6-speed automatic. The automatic is an option for the SE model. The Elantra Sport gets a 2.0-liter 4-cylinder engine generating 173 horsepower, along with a handful of performance-oriented upgrades. A 6-speed manual is standard, with a 6-speed automatic optional. Choosing the Elantra Sport adds horsepower, but this version is not as fuel-efficient as the SE and Limited. Depending on transmission choice and trim level, those less powerful models average between 31 mpg and 32 mpg in combined driving, while the Elantra Sport is estimated to get 28 mpg with either of its transmissions. The 2015 Elantra is a safe car, as evidenced by its performance in crash tests conducted by the NHTSA and the Insurance Institute for Highway Safety (IIHS). The NHTSA gives the Elantra a 5-star overall crash-test rating, while the IIHS bestows upon the Elantra its “Top Safety Pick” rating. All versions of the Elantra except for the base SE model without any option packages are equipped with a 4.3-inch touchscreen audio system incorporating Bluetooth connectivity and a reversing camera. Choose the Sport or Limited model, and you can upgrade to a navigation system with a 7-inch touchscreen display. A Proximity Key passive entry system with push-button engine starting is also offered for the Sport and Limited models. Hyundai’s Blue Link smartphone pairing and services technology is standard for the Elantra Limited and optional for the Elantra Sport. It includes one free year of SOS Emergency Assistance, Automatic Collision Notification, a smartphone app, and other services. For three months, Elantra owners enjoy premium Blue Link services such as remote engine starting and door lock operation, a Car Finder, and features useful to parents of teen drivers such as Curfew Alert, Speed Alert, and Geo-Fence boundary alerts.